It's been the worst week, or rather 7 days, since it began last Monday night with the burglary and theft of my laptop. And then on Saturday night, one of our cats, beautiful Cleo, was hit by a car. We got a message at midnight, we were deeply shocked and upset. She is in the RSPCA clinic - amazingly the person who hit her took her there, which is wonderful, I can't bear to think what might have happened otherwise, we are really grateful to him! We went to see her on Sunday, poor little thing - her hip is dislocated but the worst thing is that she seemed to have gone blind. It was so hard to see her there, just lying there, not moving. But they are taking good care of her. They X-rayed her yesterday afternoon and, thank goodness, found no internal injuries, but also no damage to the eye so the vet thinks it is nerve damage. This morning when we called, he said that one of her eyes is now reacting to light, which is an improvement, so we are hoping that it is trauma, or swelling which will go down. She is such an active cat - she'd taken to hanging out in the pub around the corner! 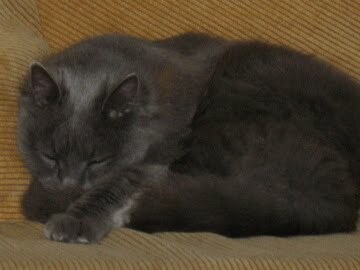 - and we didn't want to force her to stay in after she'd spent 6 months in quarantine. But if she's blind, her whole life will change. We will probably be moving her to our local vet tomorrow, round the corner, and then home soon, I hope. And today, in a sort of unrelated move, I closed my Facebook account. It suddenly dawned on me that I needed to do it. I had been feeling too "exposed", too "out there" for a while, and an unpleasant interchange this week just made me see that quitting Facebook was the right move, and would give me so much more time to write! So, a retreat, of sorts, back into myself, back into my private space, my writing space. I will miss hearing about what all my online friends are up to, getting links to newly-published stories, sharing good news and seeing pictures. I know I'll miss out on invitations to events and that sort of thing. But I hope that if anyone's interesting, they can pop into my blog, see what I'm up to. I will probably be blogging more now, as I process what I'm up to in something slightly longer than 400 characters! I look forward to writing. Perhaps, in a while, I might even have another book to promote, and nothing beats Facebook for that sort of thing, but that is a long time off, nothing in the works. Drop me a line, leave me a comment, so I don't miss you all too much! In other, nicer, news, a lovely review of The White Road and Other Stories by Ilana Teitelbaum on the Huffington Post today. And tomorrow Nik Perring will be here, talking about his lovely new collection of flash stories, Not so Perfect. I'm delighted to welcome Elizabeth Baines to my blog today. Elizabeth and I met several years ago, at a Salt Publishing event, in 2007 - just after Salt had offered to publish my book. I knew of her from her fabulous blogs, ElizabethBaines.blogspot.com, and FictionBitch and meeting her in person was a real treat! And then I read her short story collection, Balancing on the Edge of the World, which is both beautiful and powerful, stories that linger for a very long time. I couldn't wait to read more. About Elizabeth: she was born in South Wales and lives in Manchester. 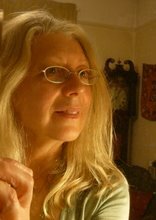 She is the prizewinning author of prose fiction and plays for radio and stage. The Short Review called Balancing on the Edge of the World (Salt, 2007) ‘a stunning debut collection’. In October 2010 Salt will reissue her first, acclaimed novel The Birth Machine. She is also a performer and has been a teacher. "How do we safeguard our children in a changing and dangerous world? And what if the greatest danger is from ourselves? A young mother fearful for her children’s safety falls under the spell of a charismatic but sinister stranger. A novel about our hidden desires and the scientific and magical modes of thinking which have got us to where we are now." Dark moods, negation, emptiness, timelessness, the endless universe; and all their opposites: dazzling light and laughter and concrete time. Something secret, something lost, a yearning for the impossible, and the comic sight of men in Masonic aprons. Trials had proved that some therapeutic herbs did have medicinal qualities, scientific knowledge confirming old wives' tales. Science making sense of magic. Synthesis, it seemed: full circle. Aching, cringing, air grazing your skin, leaves on tress scratching, a picture in your mind of yourself curled and foetal. A green mound of a hill like a pillow. Solid, crumbly; scorched and barren; rich, the fork turning up potatoes like gems, like stones. Dead potato plants like rags. This land was once under the sea. The pink sandy earth shifted, in little hollows. I hope this has whetted your appetite! Find out more about the book and buy it from Salt, and listen to a podcast of Elizabeth talking about Too Many Magpies. Visit Elizabeth's last blog tour stop, over at Women Rule Writer and put June 2nd in your diary for her next stop, over at How to Write a Novel. Thanks, Elizabeth! Can't wait for the next book..
Coming up next week: I host Nik Perring to talk about tiny things of great beauty in his new collection, Not So Perfect. So, on Monday I wandered around our flat looking for my laptop. I couldn't find it. I thought I was going insane. Had I hidden it somewhere? Then J discovered the marks of a crowbar outside my study window and we realised we'd been broken into - they only took my laptop and iPod. Only. That laptop felt like an extension of my hands, my brain. I had backed up mostly, and thank goodness from Gmail, the majority of my stories are in the ether, accessible. But passwords and things... I had a real panic, and one sleepless night. Such a violation. And of my study, my safe space - now it's my unsafe space. I have no computer now. I do need to get one. Luckily I had a wonderful day planned yesterday, going to the recording studio and listening to my flash stories being recorded by 2 amazing actors for broadcast on Radio 4 on June 29th & 30th and July 1st. It was very emotional for me, and I was pretty emotional already! So today I thought of something else to cheer me up. I'm in the biochem lab, where I "embed" one day a week as writer-in-residence, and today I am blogging LIVE from the lab... So, if you ever wanted to know what it is that scientist actually do all day, check out Bristol University Science Faculty's brand new blog. (I am blogging from my mobile phone, forgive any odd spelling. ) Comments welcome! 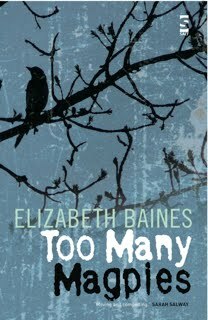 Coming up tomorrow: I an delighted to be hosting Elizabeth Baines as she jets around the virtual world on her blog book tour for Too Many Magpies! Won't be doing that from my phone, Elizabeth's wonderful book deserves better than that. Stay tuned. Fiction Writers Review - a giveaway in honour of SSM! And if that's not enough - just check out all the short story collections and author interviews we've amassed in 2 1/2 years over at The Short Review, of course! The 2010 Bristol Short Story Prize longlist has just been announced! I am one of the judges of this year's prize, but we weren't involved in picking the longlist. Our deliberations were, of course, all carried out anonymously. The longlist is here, nice to see some familiar names and meet new ones! Creativity Jumpstart: Turn your travels into stories (June 16-20th): "Whether you want to write fiction, travel narrative or creative nonfiction, learning how to use your travels and observations about place in your work can reap huge rewards. For award-winning novelist and short story writer Nicholas Hogg a motorcycle journey across the emptiness of the Australian outback ended in a crash but inspired his first novel Show Me The Sky." Novel Boot Camp: The Pleasure of Progress (June 21-27th): "Sometimes we just need a little sympathetic nudge to get started or to press on with that novel. And sometimes we need the structure, dedicated time and advice that simply never materialises in our daily lives. If you’re nodding your head in agreement, then this boot camp is for you." 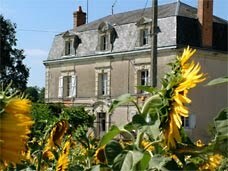 Both courses are being held in a heavenly-looking 19th century house in the southern Loire Valley. Wish I could go... there's now a 10% discount off Creativity Jumpstart - Click here for more information. 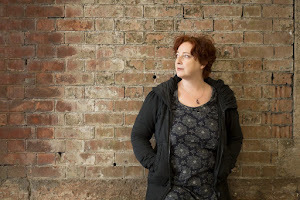 Another writer pal, Michelle Teasdale, has just launched a new website, Winning Words, "a directory of magazine deadlines and creative writing prizes, and a forum where members can get feedback on their work before submitting". I looks like a brilliant endeavour, something much needed, especially in the UK, although it's open to all. There will be a very small fee to avoid the need for advertising, which I think is a good idea. This is an enormous amount of work, we shouldn't expect to get everything for free, so do go and sign up. The official launch party is on May 27th in London, with the ever-fab Vanessa Gebbie as guest of honour, providing top tips! Best of luck, Michelle! Authors write a science fiction or fantasy short story which is inspired by a scientific discovery or innovation made or announced within the past year. It can’t be peripherally added: the science must be integral to the story. Writers must include a link to a relevant article or study of the applied science when they submit their stories.” A panel of 6 amazing judges will vote on the finalists. There’s $400 of cash prizes to be won, plus subscriptions, books, etc. Your story must be 2,500-10,000 words long, which means I need to up my word count if I'm going to enter. Where to find recent scientific discoveries? How about the always-inspired NewScientist.com or ScienceDaily, to start with? If you've never tried this before, then have a go, this isn't aimed at people like me who already know how fascinating science can be, but I imagine the aim is to open writers' eyes to new sources of inspiration. Good luck! PS Don't forget about my list of UK & Ireland lit mags that publish short stories - we're up to 108 magazines, and this is not just for UK and Ireland-based writers. I am sure all these magazines would be delighted to consider your story, wherever you are! I am in a good mood today. This has nothing to do with post-election euphoria, that's certainly not it - the politics here right now are rather too closely resembling Israel's political system for my liking and the results were not what I would want. But that aside, it's been a great week - I've come up with a Big Idea, as I mentioned in the previous post, and - while a little nervous about how to do it, and worried that maybe someone else has already done it - I seem to have found no evidence that it's been done. And, as several lovely Twitter pals assured me, I'll do it in my own unique way so not to worry. I also mentioned it to the researchers in the lab and they didn't think it was lame - and then I spent a fascinating afternoon watching a scanning electron microscope in use, just amazing! I am also in a good mood because yesterday we had one of our 24-hour flash writing "blastettes" on the online writing group I belong to. Someone compiles 24 sets of prompts and posts one set every hour. Whenever you have time, you open a set of prompts, write for 20 minutes or so, then post up your first draft anonymously. I hadn't written anything for weeks. (Well, I did write together with the students I did a reading for at Bath Spa University last week - nearly scuppered by a sore throat but thankfully all was well - but that was it.) I wrote 5 stories yesterday. Or 5 somethings. And I felt - as I have said here before - much, much better. Healthier. Saner. More energetic. I had been having very colourful dreams, and I think perhaps that was because I hadn't been giving my imagination its regular outlet, in fiction! I went in to the Nanoscience and Quantum Information Centre, my base of operations for my writer-in-residence, and for the first time I used my desk and wrote there. It was great. No infiltration of nanoscience into what I wrote, but it is nice to have somewhere else to go. And... on my way out I noticed a poster advertising an upcoming event, in July, with a visiting speaker from Harvard, which is directly related to my Big Idea. Made me feel, once again, that something mystical is happening, that this is definitely the right thing to be doing. Ok, now on to the second part of the blog post. We had our first Bristol Short Story Prize judges'** meeting a week ago, it was lovely to meet the other judges. And we are now in possession of the longlisted stories. All is strictly anonymous, I am not going to say anything at all about specific stories, of course. I am enjoying quite a number of them, some have even made me laugh out loud, which is a rare thing for me. But. But. Since I am judging another comp, the Sean O'Faolain, which is still open to submissions, then it might be worth your while to take heed of this next bit. I am sure all those in the same position as me would stress this. CHECK YOUR SPELLING AND PUNCTUATION! I am going to repeat this just to hammer it home. ASK SOMEONE ELSE TO READ YOUR STORY AND CHECK FOR YOU. do you think I will be focussing on how imaginative your plot is, how compelling your characters? No, I will be gnashing my teeth. Pulling my hair out. Shouting at the cat. The odd missing comma, I can forgive that. A paragraph not indented bugs me a little but if I am swept away by everything else, I can get past that too. But when it is constant - commas not where they should be, and many of them in places they don't belong, spelling mistakes far too often - then you've missed your chance with me, I'm afraid. A literary magazine editor would not be so patient either, I imagine. A good editor will spot a few typos, glitches. But anything more than that and this is just sloppy, this gives the impression that you didn't care enough to check. I have just realised that I sound like the worst kind of English teacher. I'm sorry, but I don't care. I pick up every story and what I say as I begin is: "Wow me." You cannot go wrong by asking several friends to read your story, checking and re-checking. Don't lose the chance of your otherwise fabulous story not even being read just because you didn't bother. I am waiting to be wowed. Don't let me down. **ADDENDUM: I just want to make it clear that this is in no way a comment on those fabulous folk who read and compiled the Bristol Short Story Prize longlist. This is just me venting about something that has struck me from all the reading of short stories I've been doing over the last few months, for Southword and others. I am one of those very picky punctuation people, an "Eats, Shoots and Leaves" kind of nerd, and this is what gets in the way of my particular reading experience! Wonderful news! 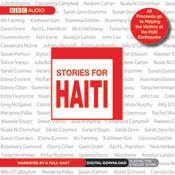 The fabulous fundraising 100 Stories for Haiti is now available as an audiobook, with 20 selected stories, including Mugs. Another way to support the Red Cross' work in Haiti - and be highly entertained at the same time. Get it on Audible.co.uk, Audible.com or iTunes. I can't wait to listen to it. In other news, I had a revelation last night. I was having a quiet night by myself, contemplating my writer-in-residence position, which I am very much enjoying, but which right now lacks any sort of structure or set project. And suddenly something presented itself as a solution... so now I think I can say I am working on a new book! I am not going to go into details right now, because I am a little nervous that if I talk about it in public it may dissolve or sound ridiculous. But I am pretty excited because it's not just more short stories, it is something that is a new intellectual challenge for me, and something I think - I hope - is fairly innovative. Anyway, I might reveal more in due course, but I feel relieved to have found myself a framework within which to carry out this residency and some kind of end product to work towards.Phew! Let's hope I don't wake up tomorrow thinking it's all a terrible mistake.This is all new to me, this first flush of excitement - I've never experienced this before, I had no idea when I was writing the stories in The White Road that they might be a collection. I've never consciously worked on anything book-length from the start. First comes the idea for a new novel. Fabulous! (Literally, one might say). It hits me on the tongue like sherbet. If I’m in a supermarket, I will stop mid-aisle. Walking the dog, I’m likely to ignore the worst canine behaviour. At this point, I’m thinking, “Yesss! Why didn’t I think of this before?” Next, I fluctuate between excitement and a more prosaic, “Hmm, but such-and-such might be a problem later.” But over the following days, as the characters grow in my head, excitement mounts and doubts fade. I am about to start to write. "damned terrifying because it’s the start of a long and unknown journey. When I sat down to write the first page of Sleepwalking, my third novel, I actually said aloud, “Oh God, here we go,” taking a huge breath to summon the strength. Many blank pages stretch ahead, and they won’t fill themselves." Yes. Exactly. Not, I want to stress, that I am working on a novel. No, definitely not. But I can imagine it being book-length, and possibly rather undefinable. Almost definitely completely uncommercial! But that actually makes it easier to contemplate. The thought that no-one will ever publish it, that I am doing it for me, makes it far easier to jump off this cliff. I hope!